Plan the size, then draw a heart stencil to fit inside it. Since this is a cutout, the stencil is in two pieces, the outside and the inner portion. I laid it on my background fabric (which is creamy with pastel flecks in it) and used masking tape on the back of each piece to hold it in place. In my photo, the green paper is the stencil and it looks like it is behind a heart, but it really is on top of the heart. If you save tiny bits (which I don't, but I might start) great, otherwise cut up several scraps into small pieces about the size of bunny ears that you cut off half square triangles and normally throw away. I made lots. This little black tray is about 7" x 8". Spray fabric glue on the background fabric inside the stencil. Then remove the stencil and sprinkle the bits on the portion that is glued. They went beyond it, and missed some spots, so I took some tweezers and sat in front of the TV and fiddled with them, not excessively but just to make sure the glue was covered and the edges had a nice raggedy look. Also, a few pieces were up-side-down and didn't look good that way. Picky, but it didn't take long to fix. Layer over with tulle or any sheer fabric to give the look you want. I used a white, glistening silk organza. The photo showing this stage was too shiny to show well so didn't bother posting it. Baste (I used plastic headed silk pins, not safety pins), and quilt it. I went around the entire heart, inside and out. Then I did some loose double feathers on the heart, and stippled the rest of it. After binding it with a pale pink that had a bit of mottled color in it, I put on a pink organza bow that seemed to suit it. I may add a few tiny pearl beads, but right now am fairly happy with it as is. Such a nice tutorial. Thanks. Wow, it came out great! I really like it. That is quite different. I've seen tulle used in different quilts and the look is subtle and amazing at the same time. You stopped by my blog awhile back and I can't remember if I responded or not. Sorry. Your heart is absolutely gorgeous. 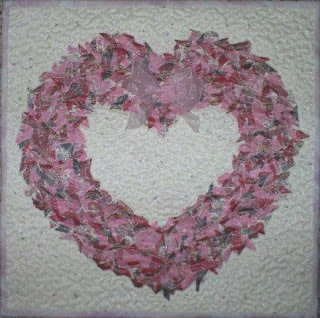 I saw this technique done by a Japanese quilter on Simply Quilts. She made landscape quilts from a photo. How did you do the edge of your tulle around the heart edges inside and out? Heart: 9 patch - done!